Unable to get an excuse for direct military intervention in Syria, Washington has revived its campaign to brand Hezbollah in Lebanon as an ‘international terrorist organization’, a plan allowing both Europe, the US and Israel enter the theater militarily, under another vague UN or NATO mandate similar to the fast-tracked waiver used for Libya. This would widen the crisis in Syria into a region war and would almost certainly drag in Iran – providing an entree to WWIII. It’s interesting to note that just a few minutes after the terrorist attack in Burgus last summer, Israeli officials announced that Iran was behind it. However, initial reports showed that the prime suspect at the time, a young Caucasian, had a fake Michigan driver’s license – but this has since been buried by mainstream media. According to Israeli Haaretz at the time, a top Bulgarian official warned it would be a “mistake” to blame a specific country or organization for the attack. The Obama administration sought Tuesday to increase pressure on Europe to brand Hezbollah a terrorist group after the Bulgarian government implicated the militants in a fatal attack on Israeli tourists last summer. Bulgaria blamed the Iran-backed group for the July bus bombing in the Black Sea city of Burgas, making official what U.S. and Israeli terrorism officials had alleged from the start. The attack killed five Israelis and their Bulgarian driver. 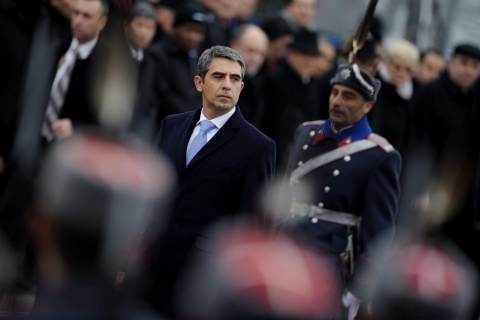 Bulgarian President Rossen Plevenliev is playing Washington and Israel’s hand, hoping to gain New World Order status by implicating Hezbollah in last year’s bus bombing. Bulgaria said evidence showed that two of the people involved in the attack were members of Hezbollah’s military wing and that they were acting as part of a campaign against Israeli targets worldwide. The United States and Israel assisted with the investigation. The allegation of a direct Hezbollah terror campaign on European soil escalates pressure on the European Union to reconsider its treatment of Hezbollah. The E.U. has resisted past U.S. and Israeli entreaties to designate Hezbollah a terrorist group. Secretary of State John F. Kerry issued a statement urging Europe to crack down on Hezbollah. “We need to send an unequivocal message to this terrorist group that it can no longer engage in despicable actions with impunity,” said Kerry. Several influential members of the 27-nation E.U. alliance have argued, however, that Hezbollah is both a political and military organization and that a blanket terrorism designation could be counterproductive. Hezbollah supporters move through Europe and raise money with little obstacle. Kerry discussed the Bulgarian allegation in a telephone conversation with E.U. foreign policy representative Catherine Ashton, said Victoria Nuland, the State Department spokeswoman. Nuland said Ashton is “well aware” of the U.S. position on Hezbollah but would not say whether Kerry specifically lobbied for a change. Tsvetan Tsvetanov, the Bulgarian interior minister, said at a news conference in Sofia, the capital, that two of the three attackers had genuine passports from Australia and Canada. He said there was evidence that they belonged to Hezbollah’s military wing and had been financed by the group. No one has been arrested in connection with the attack. Ashton’s spokesman, Maja Kocijancic, said the E.U. would discuss the implications of Hezbollah’s involvement in an attack on European soil. The United States labeled Hezbollah a terrorist organization in 1997, which bars the group from using U.S. banks and prohibits most diplomatic contact. Brennan did not expressly call on the E.U. to revisit the question of terrorism designation, but others did.